My first Luis & Clark cello, which my puppy loves almost as much as I do. Bach’s six suites for solo cello have been a major research area of mine for a long time now. After much reflection, I’ve decided to play my first ever marathon concert of all six suites in the upcoming Idaho Bach Festival (January 16-20, 2018). Six years ago, when I did my first Bach 36 project, I was frustrated by the poor tone quality I was producing in Suite No. 6. It’s written for a cello that has five strings, as opposed to the usual four, and while you can play it on a standard cello, it’s fiendishly hard and you really miss that high E-string Bach had in mind. A five-string cello is basically like a hybrid of a cello and a violin, and lets you play much more easily in the upper register. Well, to cut a long story short, I fell head over heels in love with my Luis & Clark carbon fiber cello when I bought it two years ago, and I knew it was possible to custom-order a five-string version from this brilliant company. With the generous support of the University of Idaho College of Arts, Letters & Social Sciences-Office for Research and Economic Development Partnership, plus further research funds from the Dean of the College of Arts, Letters & Social Sciences, I was able to do this, and I’ve fallen in love all over again. I never want to play the Sixth Suite on four strings ever again — and what’s more, I’m also inspired to re-learn some other high-tessitura repertoire, such as the Franck sonata, Schubert’s arpeggione sonata, and Haydn’s D major concerto on five strings. Playing the five-string cello turned out to be harder than I’d anticipated. The strings were rather closer together than on a four-string cello, and I kept bumping into the adjacent string to the one I was playing on. The hardest string to play was the D, which is right in the middle of the fingerboard where I’m not used to having a string. But I’m sufficiently convinced by my experiment with playing eighteenth-century music on space-age materials that I don’t think I’ll go back to a four-string cello for the Sixth Suite, that’s for sure. It kind of feels like cheating after all those years I spent practising the high bits and the hard chords! Here’s an excerpt from the Allemande from this morning’s practice session. To smile, or not to smile? Many years ago, I attended a summer chamber music school whose faculty were top international artists. During one of the daily masterclasses, a young piano trio performed the Brahms C major op. 87. The piece has its difficulties, and every time the players got through one of the tricky spots, they would look up from their scores and grin broadly at each other. After they’d finished, a couple of the faculty yelled at them. They said it was not appropriate to pull those wild grinning faces, that it was unprofessional, that it detracted from the music. Everyone knows that you shouldn’t pull a face or shake your head when you make a mistake in performance. My first teacher once advised me “Don’t, for goodness’ sake, let the audience know you’ve made a mistake, because most of them won’t know the piece. If you pull a face, they’ll know instantly that you did something wrong and it will lessen their enjoyment.” Wise words — and in a thought-provoking post at The Bulletproof Musician, Dr. Noa Kageyama backs up the need to keep a “poker face” with psychology research into audience reactions to a performer’s demeanour. But what about the happy faces? The photographer for the Red Lodge Music Festival, where I play and teach every summer, took this snapshot of me during a performance of the Prokofiev sonata. I didn’t actually realize that I was smiling as I played. All I remember is how happy I was to make great music with a great colleague, in front of a nice audience, and getting paid for it. (What a privilege it is to be a musician—to be allowed to be a musician!) I honestly don’t even think about my face that much when I play, other than making a conscious effort to keep it relaxed, since facial tension can cause tension in other parts of the body, inhibiting efficient technique. And yet, I know myself to be one of those people who is incapable of disguising their feelings, and the photo did give me cause to wonder whether I was becoming the kind of face-pulling clown my mentors would have scorned. So Elschenbroich’s comments made me feel better. Maybe the “mistake face” is the one that we should definitely avoid, but the “happy face” isn’t necessarily bad? I was delighted to read the following review from Stringendo. It’s not often that your book gets a review almost two years after publication, so I was pretty happy. I liked Kashkashian’s advice to take the personal out of it. It’s good to remember that most criticism is a gift. It may hurt at the time, but it’s rarely meant personally and almost always intended to help us get better. But I was taken aback that Kurtág hadn’t even noticed the effect he was having on a student (though to his credit, his response to his wife’s warning was kind). Surely most of us would recognize that a student couldn’t handle what we were saying, and back off? That made me start thinking about the whole tricky phenomenon of the masterclass. Now that I’m on the giving rather than receiving end of them, I wonder more and more what they’re actually for. Clearly, they’re a chance for a student to have a lesson they otherwise wouldn’t get to have–but how much is truly accomplished under the pressure of performing in front of one’s peers, and possibly one’s own regular teacher? Is it so the visiting maestro can posture and grandstand in front of a captive audience? Is it to give some amazing life-changing revelation to the student so that she will now be able to play far better (in the moment, at least, under the influence of a jolt of adrenaline), while her regular teacher sits in the corner feeling sad that he’s never been able to get her to play half so well? Is it one of those chores that touring musicians just have to do when they visit a conservatory, but find a bit boring and annoying? When I was a student, I hated masterclasses. I always felt awkward and embarrassed, but it was impressed upon me that I ought to take every chance I could to be in one. There were good ones and bad ones. I never had a truly awful one myself, but I remember being in the audience for several where the student on the stage was fighting off tears, or lost the fight altogether. Maybe the teachers thought they were toughening the students up? But were they oblivious to the fact that they were having exactly the opposite effect? What good came of this? Once, at an international competition, I watched a member of the jury well known for her terrifying personality reduce a student to jelly by shouting at her to take her woolen hat off. It was an icy winter day and the hall was far from warm, and I didn’t see what a big deal it was for the girl to keep her hat on. The jury member wasn’t having it, though, and delivered a five-minute monologue on how incredibly rude it was not to take one’s hat off in a masterclass, even after the girl had removed it and was sitting there in tears, her head bowed over her cello in shame. What exactly was accomplished here? Did it help the student improve? What would she take away from this class? Probably nothing, besides an anecdote that might one day become funny about that time she met Mme. So-and-So and got screamed at. On another occasion, at the Manchester Cello Festival, I observed a leading international soloist ridicule a way the student played the chords in the opening solo of the Dvorak concerto by comparing him to a duck. “Da-dee-da-dee-da, QUACK, QUACK, QUACK, QUACK, QUACK!” he bellowed. “That is how you sound!” The audience tittered sycophantically. I don’t think the student found it all that funny. There are times, I think, when it is personal. When I’m teaching a masterclass, I’m mindful of the fact that the student is probably nervous, both because she doesn’t know me well and because she’s having to perform both for a stranger and for an audience of her fellow students and possibly also her teacher. There’s a lot at stake for her. Sometimes you get a student who really is hopeless, like the poor Dvorak-player in Manchester, but what’s the point in ridiculing? Under the right conditions, anyone can improve their playing, even if they aren’t going to be the next Yo Yo Ma. It’s my job to help people get better. If I’m being paid to do something, I need to do my job. Sometimes I wonder if masterclass-givers ought to sign some kind of equivalent to the Hippocratic oath before they’re allowed to teach one. “First, do no harm.” Second, really don’t make it personal. Hold people to strict standards of musicianship, but be gentle with them. If we expect a student to focus on the music, so too should the teacher. I’ve written about this quandary before in the epilogue to my book, Cello Practice, Cello Performance. Several years ago, I had a moment of revelation when I realized that one of my top technical problems–bowing my head and hunching over while playing the cello–was caused by my introvert’s fear of other people. I found a solution to my problem by taking inspiration from the way that television newsreaders appear to gaze steadily and naturally at the “audience” (even if it’s only the camera). What would happen if a newsreader delivered the news with her head down? Her message would be lost. And it’s not that different for us, the performers of music, and the messages we want to share. But seriously, would that be so terrible? Why does a musical performance have to be this hallowed thing where the person on the stage seems so remote that they might as well be on TV? News flash, they can already see you and you can already see them. Why do we pretend that we can’t see each other for what we truly are? I repeat: would that be so terrible? To make ourselves vulnerable, to give ourselves a chance to share our true feelings in the hopes that love may be reciprocated? Why do we hide our innermost and most beautiful feelings? Why do we worry so much about what “they” might think when in reality, chances are that “they” are so wrapped up in their own pain and their own anxieties that they aren’t thinking anything negative about us at all? Those lines have become a cliché, but they’re good words to live by. Performing is like that. Putting yourself out there and truthfully expressing the emotion of music to an audience who needs that music now more than ever. We live in troubled times. In the face of this horror, it’s so tempting to withdraw into silence. When we are scared or we don’t know what to say, it’s all too tempting to fix our gaze on the floor, to hide behind the music stand, to go inwards. Or we can be exceptionally brave, and speak the truth. There’s that expression “facing the music.” Even when there are a few things in music—and in life—that we don’t want to face, it’s the artist’s job to do so. We must show up. We must speak the truth. We must be grateful when others show up to hear and see us. The world may be falling apart, but we still have music. And it’s in music that I find answers. When I’m at my saddest, I turn to one of my most beloved pieces of music, Bach’s Actus tragicus BWV 106 (“Gottes Zeit ist die allerbeste Zeit”). The crossing recorder parts remind me of all the crossroads at which we find ourselves. The “footstepping” basso continuo line (my job!) reminds me that we are always walking towards the unknowable, and we mustn’t look away. And then do what we do best, in the hopes that it may, even in some tiny part, take some of their pain from them. (1) Miranda Wilson, Cello Practice, Cello Performance (Lanham, Maryland: Rowman & Littlefield, 2015), 116. Under normal circumstances, musicians don’t have much political power. We don’t like to admit this, because we want to be the “critic and conscience of society.” In the face of oppression, we want to speak the truth fearlessly, like Pete Seeger. Or fearfully, like Shostakovich. In reality, our protest songs and our satires go unheard or misunderstood. We may stir the hearts of our audiences, but we don’t soften those of our leaders. That’s under normal circumstances. But recently? Nothing’s been that normal. Nothing at all. All of this creates quite a big problem for America’s soon-to-be rulers, doesn’t it? Ever since there has been such a thing as a ruling class and a music profession, each group has had something the other wants. 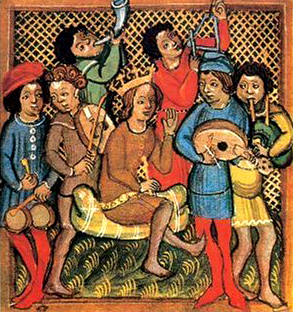 Consider the troubadours, wandering around the south of France pretending to be in love with wealthy patronesses, who were presumably fond of showing off their pet troubadours to their wealthy girlfriends. Consider just about the entire career of Johann Sebastian Bach. This is how it goes: musicians provide the rich and powerful classes with status symbols. Music, being expensive, is “classy” in every sense of the word. By the same token, musicians are the perennially broke supplicants to the ruling class, whether we’re looking for sponsors or applying for government arts grants. That’s how the world has always worked. Until now. Under normal circumstances, money could buy pretty much everything. Until now, it was always clear which one of us was singing for his supper and which one was paying the piper. But just as so many things have been turned upside down recently, so has this. The only precedent I could think of where musicians have made their point by not performing is the famous story of Haydn’s Farewell Symphony–surely the most imaginative response to a labour dispute in music history. Obviously, since I’m not an international superstar, no one’s going to ask me to play at the presidential inauguration. But I did ask myself what I would do if–by some wild leap of the imagination–I were offered a substantial sum to do so. I’ve never been averse to the idea of selling out, but in spite of my modest avarice for the largesse of rulers, I think my conscience would compel me to turn it down too. I recently came across this ca. 1617 painting of St. Cecilia playing the viol by Domenico Zampieri (1581-1641), known as Domenichino for his small stature. The picture struck me for a number of reasons: the instrument (how many strings? The fierce lion’s head on the scroll! The large size–a precursor of the modern double bass? The shadowy suggestion of frets on the fingerboard); the most unrapturous expression on the face of the saint; the redness of her nose (was it cold in the artist’s studio? ); and the cherub standing at her feet holding the score (which she isn’t looking at), presumably turning her pages. That cherub. Who among us couldn’t use one of those? I guess the page-turning problem has existed for a long time. How many times have I been playing some composition with few or no rests in which one might rapidly turn a page, necessitating a moment of panic where you think you might get lost or not come in at the right time? The creative photocopying-taping combinations I’ve had to make, the binders I’ve had to augment with pieces of cardboard secured with duct tape! And all along all I needed was a cherub to do it for me. I’ve thought of another use for him: he could put St. Cecilia’s mute on and off too. There exist a number of websites for complaining professors. OK, everyone needs to vent sometimes: goodness knows professors have the right to be a bit peeved about low pay, budget cuts, departmental skulduggery and so on. Whether the internet is an appropriate forum for such complaints is another matter; I figure they’re grown-ups and if they want to put themselves out there for public scrutiny and possible damage to their careers, that’s their business. But then there’s one type of whiny-professor website that really gets on my nerves: the ones where they complain about their students. This, I think, crosses a line. When I become the emperor, I’m going to make it illegal for professors to grouch about the shortcomings of high school teachers. Teachers have a lot to do, and they’re doing their best. Chances are they’re already trying to teach students all the things professors wish they knew, but they’re stymied at every turn by bureaucrats who expect them to be fundraisers and therapists and moral exemplars and get their class to score highly on standardized tests. It’s no fun. Here’s another thing. It’s OK with me, as a professor, if students begin university not knowing anything. Because there’s a presumption, isn’t there, that it’s my job to teach them things. If they leave university still not knowing anything, then shame on me. I sat down to write a list of things I wished students would learn before university–a perfectly shaped, flexible bow hold? a natural sense of intonation? knowledge of how melody and chord progressions work? some idea of how to practise? Well, of course those would be nice. But the more I’m in this business, the more I think character has more of an influence over how someone does at college than prior knowledge. In fact, I think the predictors of success could be reduced to just two character qualities. The ability to deal with frustration. Curiosity, passionate curiosity, about music is a driving motivator. Human beings are motivated by curiosity and desire. The desire to be good at it and do whatever it takes to improve in the practice room. The desire to take it to bits and figure out how it works in the theory class, and to understand its historical-philosophical context in the musicology class. The desire to know everything, understand everything, find out more. The curiosity that motivates you to practise ambitiously, listen voraciously, read widely, argue passionately, work obsessively. The other thing is that music is hard. It’s hard to get good at it, it’s hard to break into the profession. If you crumple at the first sign of adversity, that’s a big problem. I see so many music students who have never been told anything other than how smart and special they are who, the first time they run into something they aren’t good at, dissolve into tears and/or decide they don’t want to or can’t do it any more. And then you see a certain type of student who comes to college maybe a little less prepared than you’d like, with some technical problems, or limited musicianship skills, but something about her makes you take a chance on her, and she ends up being your best player. Because she genuinely loves music enough to want to be good, and patient enough to hang in there long enough to get that way. Further to the same kind of idea, I recently read The Triple Package by Amy Chua and Jed Rubenfeld, a book that seeks to quantify the personal qualities that produce success. It got panned by the critics (justifiably, I think) for certain racist and poorly-researched aspects, which is a pity because there’s a lot of persuasive arguments for character in there. Chua and Rubenfeld came up with three success traits: (1) a superiority complex, (2) a sense of insecurity, and (3) good impulse control. That’ll work too: the contradictions of a high-achieving personality combining to motivate you, and the self-control to make things work. I wish Chua and Rosenfeld hadn’t tied their thesis to certain ethnic and religious groups (including their own), however. Might it not have been better to frame it as a set of universals that people of any race or social group could cultivate? *I give a free pass for dead grandmothers. Mine died at the beginning of an exam week during my second year at university, and my teachers were all very kind about it. It’s not easy being a school music teacher. I don’t know this from personal experience, because all my teaching experience has been in universities and my own private studio. But as hard as I work, I’ve never experienced the daily stress of having to defend my own job against a board of education that believes a subject is only worth studying if it’s directly applicable to the needs of the job market. This, I suppose, is why I keep seeing articles like “The Scientific Reasons We Should Teach Music To Kids in School” by Tom Barnes that stress the cognitive benefits of studying music, with the usual reasoning that doing so will improve students’ test scores and abilities in STEM subjects. But here’s the problem with touting the extramusical benefits of music. Saying children should study music because it’s “good for them” undermines the very thing music teachers do in their classrooms. Music is not a daily vitamin or a nasty vegetable that you have to eat before you can have ice cream. Music is worth studying because music is wonderful. Music isn’t just wonderful. It’s sublime, profound, challenging, polarizing, life-changing. Brain scientists have demonstrated that music activates our pleasure circuits. Survivors of suicidal depression report that music has saved their lives. Music is our companion and our consolation. Music is how we communicate with the divine. Music accompanies every significant ritual of human experience. As William Congreve famously observed, “Musick hath charms to soothe a savage breast.” It hath a few other charms too, such as stirring the savage breast back up again. If it wasn’t, why would so many political and religious establishments seek to suppress it? Lady Macbeth of Mtsensk, a drama with a text, might have provoked Shostakovich’s initial problems with Stalin’s government with its immoral subject matter (plus a shockingly suggestive trombone solo in Act One), but his other works, even those with no text or story, were enough to get him officially censured in the sweeping cultural reforms of 1948. Music is so dangerous that even a dissonant interval between two notes–the tritone–was considered so subversive by the medieval church that they called it the “devil in music.” If those musicians were allowed to use this diabolical interval, who knew what unholy Dionysian chaos they might wreak with it? After all, Orpheus’s lyre was powerful enough to persuade the guardians of the Underworld to let him cross the Styx. The implication is clear: music breaks rules. Music is above the law. We musicians have always had a little problem with authority. This being the case, is it really any wonder that those in authority are so quick to cut the music budget? Music isn’t going to go away, no matter how much those in power try to suppress it. People will always write and play and listen to and talk about music. What will happen, what is already happening, is that the joy of making our own music will be the exclusive preserve of the middle and upper classes, i.e. the people who can afford to study privately, if it disappears from schools. Do we really want music to be a polite middle-class profession? We might be shocked that Mozart had to sit at the servants’ table in Salzburg, but it goes to show that music study wasn’t always for the moneyed class. Mozart was singing for his supper. What I’d like to see–not instead of, but alongside the plea that music makes you smart, or competent, or more likely to exercise your right to vote, is a plea for music for its own sake. For the sake of all that is beautiful and good and truthful. I stand by this statement. You can’t turn on your television for five minutes without learning of disaster, war, the violation of human rights, torture, epidemics, starvation, and the abandonment of hope. We can do almost nothing about any of it, except to give whatever money we have to the cause that horrifies us the most. But making music is one of the very, very few ways that human beings can do something. Music affords us a chance to create beauty in a world that is full of ugliness. If we expect today’s children to change the world, we must honour their right to make music.